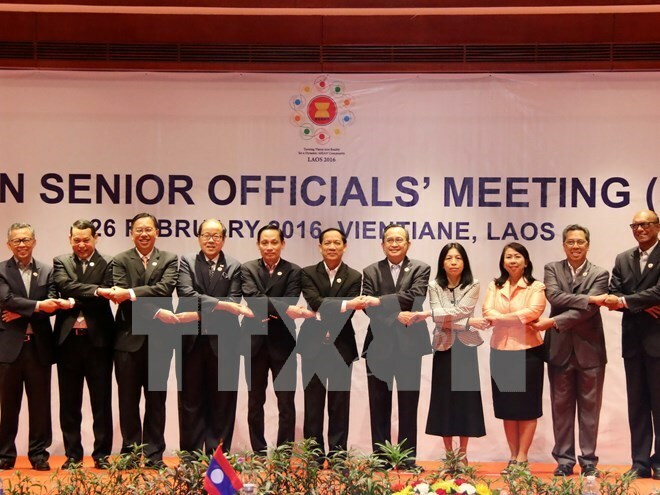 Vientiane (VNA) – Senior officials representing the 10 member countries of the Association of Southeast Asian Nations (ASEAN) joined talks in the Lao capital of Vientiane on February 26 ahead of the ASEAN Foreign Ministers' Retreat. The Vietnamese delegation to the event was headed by Deputy Minister of Foreign Affairs Le Hoai Trung. The ASEAN Senior Officials’ Meeting (SOM) discussed a range of important issues, including ways to effectively realise the ASEAN Community Vision 2025, as well as relations between the group and its dialogue partners. The officials were also given information on the progress of the post-2015 Plan on ASEAN Connectivity and preparations for the third phase of the ASEAN Connectivity Initiative. Under the theme “Turning vision into reality for a dynamic ASEAN Community,” Laos, as the ASEAN Chair in 2016, has proposed an array of priorities, including narrowing development gaps in the bloc, and increasing ASEAN connectivity, tourism development, small- and medium-sized enterprise development, trade facilitation, job generation and ASEAN cultural heritage preservation.